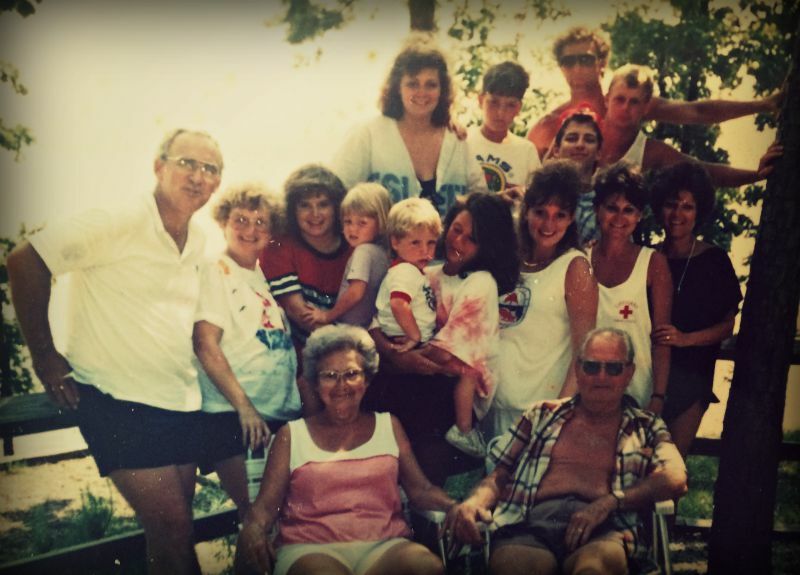 When I was young, my family spent Sunday lunch at Nanny and Pawpaw Neel’s house. Regardless of what kind of week we had or how chaotic the rest of life seemed, those few hours were reserved for 130 North 14th Street. Still in our “church clothes” (not wanting the time we spent ironing them the night before to go to waste by only wearing them for an hour), we’d park on their root-cracked driveway that was just long enough for three-fourths of a car, race across the cool, rooty St. Augustine grass, run up those steep concrete steps, and knock on the locked screen door—Nanny was serious about locked doors. The smells of baking bread and pecans were the first to greet us when the door opened; the second greeting was from Pawpaw, with his wide smile and his shirt unsnapped down to his belly—a small picture of this carefree man. We were clearly his delight. And beyond the delicious smells and warm greetings, their house was full of tangible comforts, too. After sneaking Wrigley’s Spearmint from the drawer just inside the den, we’d plop onto the kitchen stools to watch Nanny Neel work her magic. She was always busy in the kitchen, but effortlessly so. Cooking and feeding were her gift; she was an artist, and watching her create in her studio was also a gift. Since my mama was the baby of three, she was never expected to contribute anything to the meal—I guess that’s one of the compensations for the total number of her baby pictures adding to zero. I get it, by the third, you’re tired. In the winter time, we would take turns standing over the floor furnace. We’d keep to the heat as if it were a newborn baby—there wasn’t a minute that it was left alone. I loved that furnace. After all the food magically arrived at just the right temperature (how did Nanny do that? ), we circled up to give thanks. No matter how spiritual the prayer sounded, what we were really thinking was, thank you, God, for this gift you’ve given our Nanny. “Make your plate,” she’d say—even now, 30 years later, when I see a sturdy Styrofoam plate, I hear those slow, familiar words. Our favorite Sunday lunch was chicken-n-dumplins (What exactly is a dumplin? And where is the “g”? These are questions I still ask.) and rolls. My goal was to fill that plate with as much white, starchy food as it could hold—I quickly learned that, at my grandparents’ house, the adults paid no attention to unnecessary details like portion sizes. Then I’d open up those hot rolls and pour homemade muscadine jelly on like syrup—no less than five rolls and no more than eight, usually. I loved those rolls. I guess the tables were eventually cleared and the dishes were eventually done, but that also seemed to happen magically. Us kids just let the adults do the adult chores. The only expectation of us was to eat and be loved. The Neel Family, circa 1989. Nanny and Pawpaw sit in front, just as happy as pie. Heather is in the front middle, holding her cousin. Behind her are her sister and mom, along with the rest of the Neel clan. Photo courtesy Heather Harrison. We ended each Sunday sitting on the stiff living room couch, some fell asleep and some would talk about all the important things like septic systems and new carpet for the camper. My sister and I would give updates, too—her cheerleading tryouts, my dance recital. I love my Nanny and Pawpaw Neel. Pawpaw has been gone seven years this November. I miss him something deep. I miss him teaching me to hold my fishing pole just so; I miss him throwing me to the sky in DeGray Lake; I miss his calm comfort. And while Nanny’s days are drawing to a close, at 94, she dreams about Pawpaw often. Death has just been a small interruption for them. You can tell when you talk to her that she can’t wait to see him. I’m sure she has a lot to tell him. But even when they are both gone, they have left all of us with dear memories that were born from their simple desire to be with us and hear us. For it was the time and love and attention given that was the fertile soil for each memory to fall on and grow into something that would provide comfort to us for the rest of our lives. And those are gifts I hope to pass along to my loved ones every day from now until I get to visit with Nanny and Pawpaw again. This piece originally ran on Heather Harrison’s blog, wadinginthedeep.blogspot.com. Visit Wading in the Deep and The Not-So-Blank Canvas to read more of Heather’s wonderful works. This is amazing that you can recall such warm stories. Thank you Heather for a wonderful tribute to Nanny and Pawpaw! Thanks for bringing back all those memories! To know Herb & Jessie is to love them! I,m new to Sunnyhuckle,but I am really enjoying the stories so keep them coming!!! Thank you, Patricia. So glad you’re enjoying the site! Beautifully written, Heather. Those are magical memories.